What a whirlwind the year has been. Already we are counting down the days to the bustling holiday season. 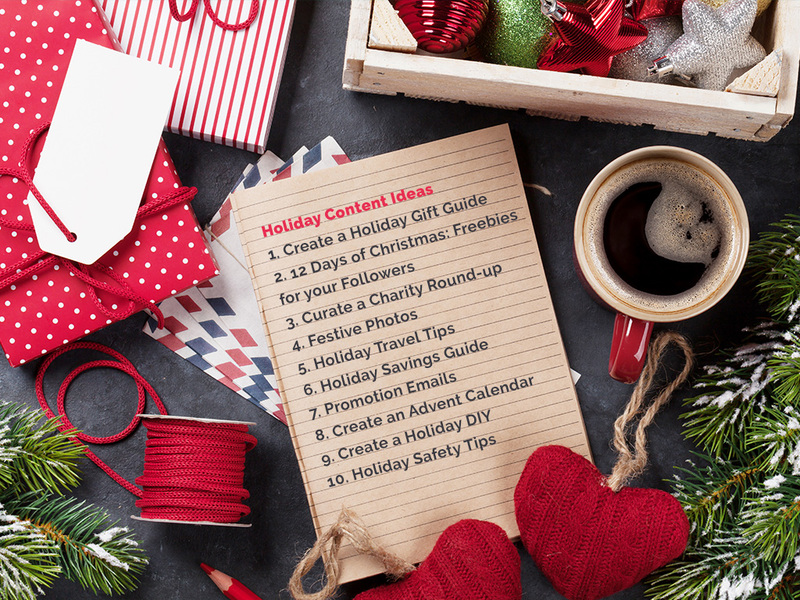 If you haven’t figured out your website’s content game plan to keep up with the holidays we’ve created this guide to get you there. The holiday season is the biggest time for business owners everywhere. This jolly season generates revenue upwards to 105 billion dollars annually, so having your content planned out to engage your followers is key. This guide will be split into three parts. Part one will discuss the tips you need to get your website’s content ready in time for the holiday season. Part two delves into 30 great holiday content ideas that you can adapt in your Content Marketing Plan. Finally, Part three will outline sharing and marketing strategies to get your content to your audience, help them to engage, and lead to high conversions. To implement a fool-proof plan for your content you need to first create and build on the plan. You want to take some time to flesh out this plan and even set dates for certain aspects of your content. Creating your strategy can be done in 6 easy steps. Take some time out to really think through the content you want to roll out this Holiday Season. This is the time to come up with a cohesive theme for your overall content and decide on the mixture of media and mediums you want your content to be. Have a brainstorm session and let your creative juices just flow. Once you’ve gotten all your ideas out order them in a list. You want to plan for all aspects of your Content Marketing Strategy at this time before fine-tuning the plan. This includes: content creation, email marketing and advertising, creating promotions, planning for giveaways, and curating other content. Once you’ve planned everything out, it’s now time to fine tune those plans and create the list of content you wish to roll out. We will have ideas in the second part of this posts that can help jump-start your creative energy. After you’ve compiled a list of at least 30-50 content ideas of various forms, create a calendar for content on your website, blog, and social media platforms. Add the content in by the days and at this step, you can even add a schedule of when the content will be published. Time to deck the halls with merriment and cheer. Follow the holiday season and keep your website fresh and up to date. Use a colour palette that matches your company colours or create an entirely new one. Update your logo to be a little bit more fitting for the season. The key here is a cohesive look to match all the awesome holiday content you’re about to give your followers. Coming up with fresh new content can be daunting for Social Media especially when you’re creating so much content already for your website, email marketing and blog. A good way to help with this is to search for content you can share on your social media page to keep your audience engaged. A good example of this is using various holiday-themed memes and graphics. Be sure to add this to your content calendar as well. Once you’ve redecorated and decked the halls of your website to match the festive vibes of the holiday, be sure to speed up your website so that the load time is quick to ensure you have a low bounce rate. Once you’ve done your Content Planning you want to create a strategy for Advertising and Marketing. Set a budget for how much ads you want to run on Facebook, Instagram, and Google Ads. This is important because you want your reach to be broad and your audience to engage and convert. Every year we prepare to buy gifts for our loved ones, and sometimes it can be difficult coming up with new and innovative gift ideas. Help your followers out by curating a list of awesome out of the box gift ideas. Works especially great if you want to promote your own products and services. The 12 Days of Christmas idea is quite popular and can be used in a variety of ways. You can roll out a number of digital freebies for your followers and promote the 12 Days of Christmas with other content like blog posts. Or you can use it as an Email Marketing Strategy. The holidays are all about giving back. Why not choose a list of worthy causes to present to your followers and encourage them to give the gift of giving to those that need. This can be tons of fun. Create festive photos to post daily across your social media networks. The Holidays are a perfect time to travel. Give your audience great travel destinations they can visit with a theme. You can do “off the beaten track trips” for example. Or just overall travel tips to beat airport congestion and flight delays. While it is the season of giving, we all want to save as much as possible while being cheerful givers, so create a great budget/savings guide to help your audience. Having an Email-Marketing plan is crucial to the holiday season. This is a great opportunity to offer promotions to your email lists. Using the concept of a month-long Advent Calendar to give offers, gifts, and freebies to your followers over the Holiday season is a great way to engage and convert. You can set your calendar up in various ways; on your website, through emails, or social media. Get creative! This can come in the form of a video or a ‘How to’ blog post about some sort of holiday DIY or hack. The holidays are a hectic season and accidents do happen. Thus create a post giving actionable advice to your followers on how to stay safe throughout the holidays. Regardless of what you offer on your website, you can adapt information that is pertinent to your following and create an E-book to offer as a free gift. This is an old time tradition that you can adapt for email marketing. Create a list of Holiday trends in your niche and share them with your audience. This is a great way to continue to grow your following during the holidays and give back something spectacular to your audience. The holidays are a great time to engage your audience and get them in on the fun. Creating a photo content gets everyone into the season of being jolly. This can come in the form of a holiday commercial or just a fun video saying thank you to your customers and followers. Make it fun, merry and bright. Kids make Christmas wish lists all the time. Why can’t you? This is a great content idea for email marketing. Another one to borrow from kids that can be great for your audience. You can make this letter comical or serious pertaining to your business goals for the upcoming year or another wish list. Everyone needs a little inspiration. Curate a list of famous quotes and even add some of your own mantras in for fun. You can keep it holiday themed if you like. Excellent time to roll out a new product, line, or service for your business. You can even create more content around the new product. Write a funny holiday jingle turn it into a music video and share it across social media. You can even turn it into a contest and invite your followers to do the same. Have some great information to share with your follower or want to help them solve a problem. Create and launch a free webinar. Add a call to action after if you’re promoting a new product or service. Create a list of gift ideas that are great as stocking stuffers. You can curate other products, use your own, ideas are limitless with this one. Having an office or company party already? Great broadcast it live on Facebook and invite your followers. Have some great giveaways too. People love to party during the holidays so why not offer them some new ideas on how to be jolly. So we mentioned creating a list of worthy Charities but the holidays are a great time to share the work you’ve been doing with other charities. It’s all in the spirit of giving. Apart from a Christmas and New Year’s Card send your followers a thank you for all their support throughout the year. You can send a round-up of your best products or blog post from throughout the year. Every year we create resolutions so why not send your company’s resolutions to your followers. Give your audience some cool ideas for New Year’s Eve parties and events. As we mentioned above, you want to be sure you budget for ads on Facebook, Instagram and Pinterest Ads. This helps to broaden your reach beyond your loyal followers. The Holiday season is a great time to grow your Email List. With every piece of content, you create to be sure to include a free opt-in to gain more subscribers. Cast your net as wide as possible by using Google Ads to boost your marketing strategy. If you don’t already use Google Ads we have a comprehensive guide that can help. That’s a wrap, folks. Hope your holiday content season is merry and bright.